A gazebo canopy makes for a great addition to any yard. Easy to set up, yet stylish enough to add a bit of beauty and charm to your landscaping, there’s no simpler way to add an outdoor gathering place. Your yard instantly becomes a much more comfortable place with the shade that a gazebo canopy provides. Protected from the harsh ultraviolet rays of the sun, you can enjoy outdoor activities with your family all summer long. Because the canopies are lightweight and breathable, the heat of the sun is readily dispersed, rather than being radiated downward like can occur with some hardtop gazebos. Some gazebo canopies are so lightweight that they qualify as portable. These come in many styles and flavors, with most of the functional differentiation in how the support structure is set up. 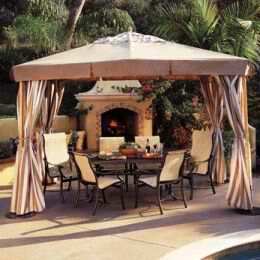 Folding gazebos tend to have aluminum poles that the canopy is stretched over. They can be set up very easily and are rather stable. Pop up gazebos can have aluminum or fiberglass poles, and generally are lighterweight but less stable. There’s a fine line between these portable gazebos and tents in many ways. Many portable gazebos end up looking a lot like a 4 sided camping tent. So much so, that they’re often actually the very same thing. In the end it doesn’t really matter what you call them, as it’s how they fit your needs that counts. You can find canopies for gazebos in just about any size imaginable. However, there is an important consideration in this regard. That is, not all gazebo manufacturers use standard measurements or attachment points for their gazebos. This means that even if you have the same stated dimensions for a frame and a canopy, they may not fit at all. While there are many other sizes available, if you stick to these sizes mentioned you are much more likely to be able to find a suitable replacement canopy later on. Of all of them, 10 x 10 gazebo canopies are the easiest to find. Perhaps the biggest problem with gazebos of these sorts are how flimsy the canopies often are. High quality fabrics are available, but more often than not the stitching or fabric will leave something to be desired. High winds or just the wear and tear of rain and ultraviolet light will degrade the canopies in just a couple years. Storage of the canopy is a big concern too. Since you can’t leave the gazebo up during the winter in areas where snowfall occurs, that means breaking it down and stowing it away for months at a time. IN storage, dry rot and pests can attack the fabric, leaving it useless when spring rolls around. Gazebo canopies can be rather simplistic structures. That doesn’t mean they have to remain so though. Manufacturers often offer accessories for their gazebos, and often you can add your own if you have a DIY attitude. Perhaps the most common addition to gazebos are insect netting. These nets usually drop or roll down from under the eaves, providing protection against insects. This can make spending the evenings out in the yard much more tolerable, and is also great on portable gazebos that you take with you camping. Another common accessory are gazebo curtains. These curtains are much like any others, though they tend to be heavier fabrics that can stand up to moisture. While usually decorative, sometimes they can serve as windbreaks or privacy screens when necessary. Sometimes these fabric coverings are more extensive, and generally are referred to as gazebo canopy panels. Generally made of the same materials that the canopy is, these are waterproof and sturdy enough to stand up to the wind. Also, they can provide the same protection as the insect netting. However, they don’t generally look very pleasant, and can ruin the views from your gazebo as well. Often overlooked, but just as important for night time enjoyment of your gazebo canopy, are gazebo light accessories. Generally these are LED string lights, which are simply strung around the framing underneath the canopy. Solar LED string lights are wonderful additions to a gazebo, as you can always count on them providing light whether the power is on or off.